The theatre major and minor are administered through the Department of Theatre. The department seeks to integrate the strengths of the liberal arts tradition with the career preparation skills necessary to graduates in the field of theatre. The program of study is designed to prepare students who are technically proficient as well as being knowledgeable and conversant in the theory, history, literature, and criticism of their discipline. 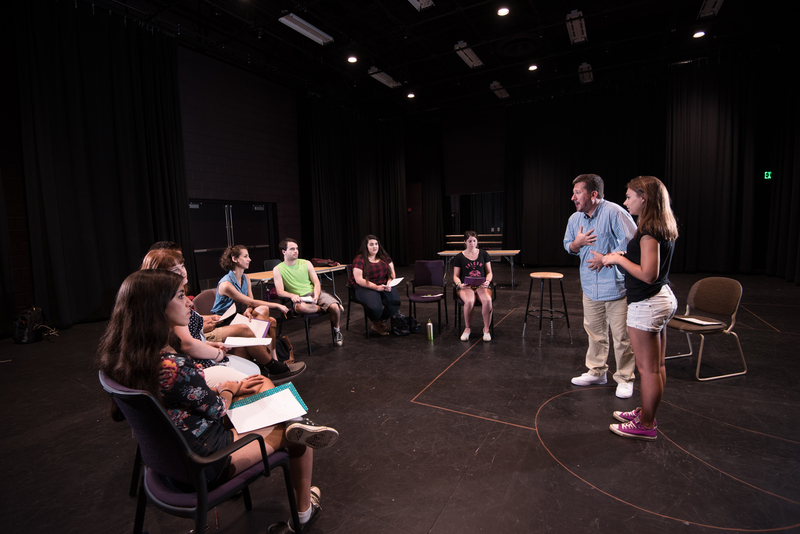 The theatre major is structured to provide students with a broad foundation in all areas of theatre as preparation for graduate study or careers in professional theatre. All students complete a common core of classes and then choose to emphasize either the performance or production aspects of theatre by completing one of three tracks: Design Technical, Musical Theatre, or Performance. Theatre electives are available to all students. At the University of Mount Union, students interested in theatre will develop skills through hands-on experience of performing, designing, and directing. Our wide selection of courses allows students to gain practical knowledge for a rewarding career. The Department of Theatre offers half-tuition scholarships to incoming students who will major in theatre. There is also a blended scholarship available for students double majoring in both music and theatre. These highly competitive scholarships are renewable for up to eight semesters and will be given to students who demonstrate a high level of competency and future promise in the field of theatre. In addition, other scholarships, which range from $1,000-$5,000 will be given to incoming students who demonstrate talent in their area of interest and show promise as a productive member of the theatre department. All awards are based upon meeting terms set by the faculty. To compete for these scholarships, performers will present an audition, and designers and technicians will present their portfolio for review. Students with multiple areas of interest may compete as performers and designers/technicians. All students competing for a scholarship will interview with the theatre faculty. Auditions and reviews for these awards are open to both theatre majors and non-majors who have been admitted to the University. All scholarships are talent-based and offered regardless of financial need. We encourage you to think seriously about your major strength in the area of visual and performing arts. Students are permitted to audition for only one scholarship. Mount Union offers visual and performing arts scholarships in art, music, theatre, and a blended scholarship for students majoring in both music and theatre. The University of Mount Union is the new home of the Great Lakes Michael Chekhov Consortium’s Acting Technique Certified Actor and Teacher Training Program in addition to being the newest member of the consortium. Michael Chekhov, the Russian-born theatre practitioner and nephew of playwright Anton Chekhov, is considered to be one of the greatest actors of the 20th century. Following an exceptional career in the theatre, he was invited to Hollywood in 1942, where he became an acting coach to movie stars like Yul Brenner, Gregory Peck, Patricia Neal and a young Clint Eastwood, while continuing his career in film. His book “To The Actor,” published in 1953, is still considered an important book in the training of actors and continues to be widely read and used in training programs all over the world. The Great Lakes Michael Chekhov Consortium is the only entity of its kind to be sponsored by an institution of higher learning that certifies teachers in the training first created by Michael Chekhov. Mount Union is thrilled to be a part of the important work that GLMCC is doing to train the next generation of theatre artists in the work of Michael Chekhov. It’s been five years since we first met at the iconic Glamorgan Castle as you sat among your friends and family, and we told you one of the old stories. Since then, we’ve been through a lot together but thanks to your support and the generosity of so many, we’re back to bring you one of Shakespeare’s funniest plays, Twelfth Night. It’s not hard to see why so many of us have chosen to make Alliance our home, and the most important reason is the good people of our city. You’ve welcomed us, supported us, told your friends about us, and asked us to come back, year after year. This summer, all over the country, towns of all sizes will open the doors of their Shakespeare festivals. Towns in Utah, Oregon, Texas, and Maine proudly boast these Theatres, and thanks to your continued patronage, Alliance has one more thing of which we can be proud. If you have a business, would you consider sponsoring an evening? Your name will be on display for patrons from Youngstown to Akron to see, and you’ll receive credit for bringing over 1000 people to the heart of Alliance – the Glamorgan Castle. Contact us at (330) 823-3875 to discuss your sponsorship.